Power stationsPower stations generate electric current in very large quantities for supply to the national grid. are usually located near coasts and rivers - often a long way away from towns and cities. Power stations use generatorsA machine that causes an electric current to flow in wires by taking energy as movement and transferring it to energy as moving charge. to produce high voltagesA measure of the energy of the electric charges in a circuit.. These high voltages cause electric currentElectric current is a flow of electric charges (electrons). to flow through wires that are connected to a network of overhead linesThick electric cables that carry electricity from where it is generated to where it is used. (which we call the distribution system). These power lines criss-cross the country carrying the electric current to where it's needed. There are lots of uses: powering trains and in factories, our homes, schools and community buildings and for lighting our streets. Sometimes these power lines are carried on pylonsA tall metal tower that carries very high voltage power lines. high above the ground, sometimes, they're buried under the ground - especially near towns and cities. To produce the high voltages needed, the power station passes the electricity through a substationSubstations are an important part of the national grid. They contain transformers which increase or decrease the voltage of an electric current. Substations are very dangerous if you try to tamper with them or vandalise them. Do not enter a substation for any reason - it is against the law and you could be electrocuted. which increases the voltage of the electric current. Then, along its journey, and near to where the electricity is to be used, more substations are used to reduce the voltage so the electric currentElectric current is a flow of electric charges (electrons). can be used safely. 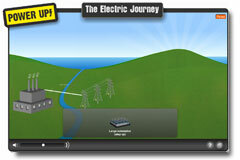 How does electricity get to our homes? Take the Electric Journey.